LB944, introduced by Speaker Jim Scheer at the request of the governor, contains recommendations for state operations and state aid to schools and agencies. Lawmakers engaged in extended debate during the first round of discussion on a provision in the bill regarding Title X funding disbursement to health clinics that also provide abortion services. Supporters said the provision is needed in light of questions raised by state audits to ensure that Title X funds are not “comingled” with funds used to provide abortion services. Nebraska receives funds from the federal Title X program that are used to subsidize reproductive and preventive health services, including the diagnosis and treatment of sexually transmitted diseases, cancer screenings and family planning services. Federal grant funds dispersed by the state through the program cannot be used to perform abortions. Lincoln Sen. Anna Wishart offered an amendment during select file debate in an attempt to find compromise on the language. The amendment would prohibit funds from being disbursed to an organization that uses abortion as a method of family planning or to an organization that provides directive counseling in favor of abortion. It also would require that entities receiving Title X funding submit a detailed monthly record of expenditures to the state Department of Health and Human Services. Wishart said the amendment would provide a “pretty clear firewall” for financial separation of Title X funds from abortion services and would create greater accountability. 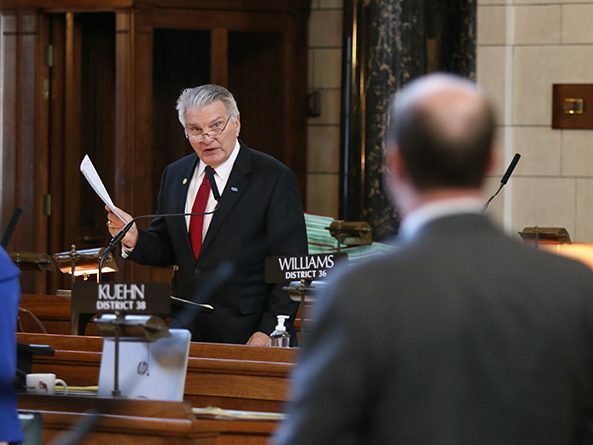 “I think that this amendment addresses any concerns that our constituents have with making sure that financially we are responsible with Title X dollars and that we are not putting any Title X dollars in jeopardy with any future audits,” Wishart said. But Sen. Mike Hilgers of Lincoln said a provision in the amendment requiring “referral upon request” would violate federal law that prohibits distribution of Title X funds to an entity that discriminates against those who refuse to refer clients to an abortion provider upon their request. “What this amendment would do would be in direct contradiction with the regulation and statutes that apply for the federal government and would put our funding at risk,” he said. After four hours of debate on the bills that comprised the Appropriations Committee’s budget package, Gering Sen. John Stinner, chairperson of the committee, offered a motion to invoke cloture, or cease debate and vote on the bill. Omaha Sen. Bob Krist said he would vote against cloture because efforts to compromise had not been reasonable and that the supporters might need to be forced to negotiate a genuine compromise. “We don’t have to pass this budget bill; we’ve got a budget in place,” Krist said, while acknowledging that “an awful lot of people” might be hurt by not doing so. The cloture motion failed on a vote of 30-8, three votes short of the number required. The Wishart amendment and several others are pending. Other select-file debate on LB944 focused on an amendment offered by Bayard Sen. Steve Erdman, which would have lowered the general fund appropriation to the University of Nebraska by $17.4 million. The amendment would have resulted in a cut of 4 percent to the university’s funding in fiscal year 2018-19, rather than the 1 percent in the committee’s proposal. Erdman said university administrative costs have increased 40 percent in the last seven years while enrollment has gone up slightly more than 6 percent. Yet instead of becoming more efficient overall, the university has threatened to cut areas that serve rural areas like the extension service, he said. Heartwell Sen. John Kuehn said that reducing funding to the university system would not have a significant negative impact on higher education or workforce development in the state. The majority of Nebraska’s higher education students attend state or community colleges or private universities, he said, yet the state subsidizes their education at half the rate of those in the University of Nebraska system. Gothenburg Sen. Matt Williams opposed the amendment, saying university administrators have been good stewards of the tax dollars invested in their mission. Sen. Adam Morfeld of Lincoln also spoke in opposition, saying the number one concern of the state Chamber of Commerce isn’t taxes or regulation but keeping young people in the state in order to maintain a highly talented workforce. For their part, college students want to live where hard work is rewarded and entrepreneurial opportunities exist, he said. “Cuts like this, year after year, to the university often times inhibits their ability to achieve those dreams and also their inclination to stay in the state,” Morfeld said. The Erdman amendment failed on a vote of 10-32.